If you judge your bloggers by the photos they take, then I expect you won’t be very impressed with me today. 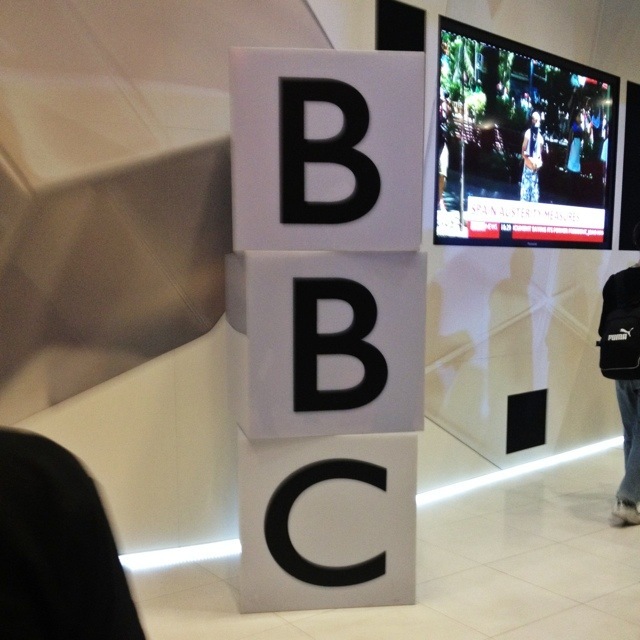 Last night, I visited the art deco masterpiece that is the BBC’s Broadcasting House and its Radio Theatre, but emerged with only a single photograph showing this gimmicky interpretation of the BBC logo, from the Media Cafe. I was there to watch a recording of Arthur Matthews’s new comedy, The Golden Age. It was very funny. There was even a small amount of audience participation, including singing – I expect that I, along with the rest of the audience, will be signed by Simon Cowell as soon as it’s aired. It was quite interesting to see a Radio 4 audience in the flesh: the stereotypes are all true! Peering through the window of the Media Cafe, it was fascinating to see the new newsroom. From that perspective, it seemed rather smaller than I’d imagined, though it still looked like a pretty nice office to work in. There was also a corner upstairs for BBC Weather, which surprised me somewhat – I thought all that was done at the Met Office. Anyway, it was an interesting experience – and free as well. I’d definitely go back! This 1,721st post was filed under: Media, Photo-a-day 2012.